A dirigible capable of reproducing full-color video ads on its sides. 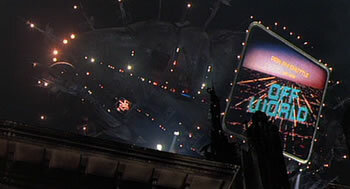 In the film, enormous airships fly close overhead, with both video and audio advertising. A new life awaits you in the Off-World Colonies. The chance to begin again in a golden land of opportunity and adventure. Lets go to the Colonies!" This is the way the airship was shown in the film.